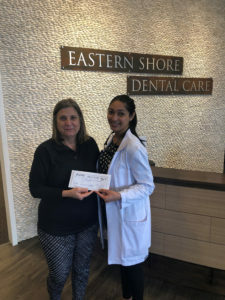 Eastern Shore Dental Care would like to congratulate Terry S. who is the winner of our December contest! Terry has won a year-long gym membership to ClubOne Fitness in Chester, MD! Please join us in congratulating Terry on her big win! Every month, new patients and current patients who refer new patients are entered for the chance to win that month’s giveaway. Do you want the chance to win our next prize? During the month of January, you could win a luxurious Couples Retreat spa package from The Spa at Chesapeake Bay Beach Club! For more information, visit our website or call out office to speak with a Patient Coordinator.